Posting this here in case MG really goes down. Ladies and Gentlemen, with great honour I present you the new Expansion Pack for JPOG!! I managed to make this a reality thanks to Procompsognathus100, who created amazing new behaviours and mods for the dinosaurs!!! This new pack also includes new skies, a new type of grass, new sounds ( taken from the bbc series Planet Dinosaur ) and a complete reskin for all the dinosaurs! These two small herbivores have a new fighting behaviour: they try to hit their rivals with their beaks and rear up to frighten them. Homalocephale will now hit its aggressor with its head, and will fight for territory, like any other herbivore. Apart from the common headbutt hit, Pachycephalosaurus has a new way of defence: it now tries to scare away its aggressor and if it gets too close it will attack immediately. The territorial behavior has also been modified, to add more realism in the game. These armed tanks have a new way of defence: while Kentrosaurus simply swings its tail to hit the predator, Stegosaurus and Ankylosaurs have higher chances of killing their aggressor with a powerful attack. In fact they can use their deathduel animation to kill every predator attacking from the front! Besides, they dispute in a new way: They use their mass to scare their opponent, using at the same time a lot of animations. If the opponent persists in fighting, the other will knock it down with its tail! These large herbivores are no more than defenseless herbivores...but they won't flee without a fight! They can now use their large tails to hit every aggressor attacking from behind. Edmontosaurus also uses its head to hit carnivores, and it rears up to crash the smaller ones onto the ground! They too have a new territorial behaviour: they threaten their opponent by hitting it with their body and using warning signals. Each one of them reacts in a different way when attacked and knocked down by a predator. These two huge herbivores now have more defensive capabilities and become very hard prey to kill! 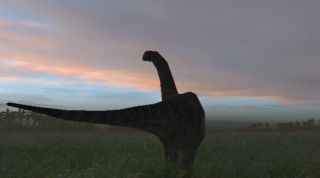 Brachiosaurus can now scare away its opponent with its huge mass, and if it doesn't retreat, it rears up to crash it into the ground, crushing it under its weight. Camarasaurus uses almost the same method, but with a difference: it can knock over its aggressor with its massive tail! Both of them uses threatening displays when fighting for territory. These herbivores possess a new amazing defense behaviour: like today's oxen and african buffalo, they stay together to scare away their aggressor and for mutual protection. They create a wall which doesn't allow to the predator to kill one of them. The predator can choose to retreat, or worst, face with an angry herd when getting too close, risking so to be killed. However even if not in a group, an isolated ceratopsian won't be an easy target. These herbivores too have the possibility of fighting for territory, using threat displays or hitting each other with their heads. These two medium carnivores will be able to grab little prey and shake them until they die. They also attack the sides of larger herbivores repeatedly to weaken them, being able to get an easier meal without many injuries. ALBERTOSAURUS takes advantage of its strong bite force by repeatedly biting its prey to tear off flesh and crush bone to kill it, much like its larger and more powerful relative, the king itself. These small predators will now act in groups to kill every creature that walks nearby. They will also attack small prey together, even if it has been knocked down by a fellow member of the group, for maximum killing effect. Taking inspiration from Planet Dinosaur, this hunter can now use its jaws like an axe, hitting its prey with its mouth open repeatedly to weaken it. It will also fight for territory like any other large carnivore. This big predator will now hit its prey with a powerful bite, ripping off flesh and tearing through muscle, until the prey weakens to the point of being unable to resist for long. They too will fight for territory with other large carnivores. If you wish to use things from our pack as part of your project, please ask permission from one of us first. If anyone has problems, just contact one of us, we'll be glad to help you! SEE YOU SOON FOR OTHER MODS!! This a a great expansion - perhaps the most advanced in behavior edits released. 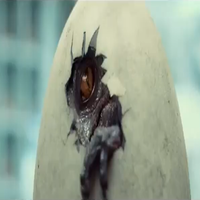 My only problem was that - after a clean install and nothing else - the raptors didn't seem too smart. They would carelessly walk right into other more dangerous animals without really attempting to flee - so they never lasted more than a few minutes for me. Another thing is that using the settings that came with the install, herbivores seem really overpowered and would one or two-shot everything. Still, remarkable advancements in this one. About Modding Genesis: It's too bad that the major hub for modding discoveries back then has been so inactive. It's understandable since the game has been out so long and interest has been lost. I wasn't around when all of the GEP stuff was going on, but just reading back through the site over the past couple years I understand why it was once the go-to spot. Everything notable should be salvaged and not go to waste, because that's JP:OG history. Does anyone know where Mamenchi posts about the mod now? If you're talking about the PMEP V2, then you can find it on facebook. Great seeing Mamenchi around here. PMEP 2 is what everyone is waiting for. Good luck to you and the team. Edit: Sorry for the trouble. I found it online. Cheers.